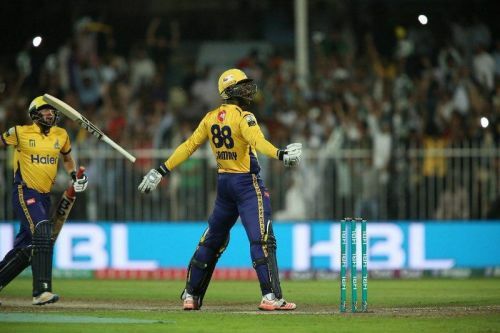 Quetta Gladiators will take on Peshawar Zalmi at Dubai International Cricket Stadium in the third fixture of PSL 2019. Sarfraz Ahmed will lead the Quetta Gladiators while Darren Sammy is in-charge of Peshawar Zalmi. Both the teams would be hoping to start their campaign on a winning note in the fourth edition of the Pakistan Super League. The stage is set for another epic encounter between two quality sides. Quetta Gladiators would be aiming to avenge their defeat in last year’s Eliminator, in which they were knocked out by the Zalmis by just one run. The Gladiators have a well-balanced squad this time around with some exciting talents. They have managed to grab some premium all-rounders in the form of Dwayne Bravo, Shane Watson & Sunil Narine in their ranks. The bowling attack will be led by Sohail Tanvir, Harry Gurney, and Fawad Ahmed while their batting department is also solid with the likes of Dwayne Smith, Sarfraz Ahmed, Rilee Rossouw, and Sarfraz Ahmed. Peshawar Zalmi were the runner-ups in the last edition of the Pakistan Super League. They would be looking to clinch their second title in this season under the leadership of two-time T20 World Cup-winning skipper Darren Sammy. Peshawar Zalmi will rely heavily on the top order batsmen -- Imam-ul-Haq and Kamran Akmal as their middle order seem a bit fragile. They lack explosive firepower in their batting line-up. Kieron Pollard, Liam Dawson, and Darren Sammy will be the floaters in the slog overs. Peshawar Zalmi will be the dark horses in the fourth edition of the Pakistan Super League. Dwayne Bravo is currently playing in Big Bash League for Melbourne Stars so he will not feature in this match. Sunil Narine is out due to his finger injury and Max Waller will replace him. Imam-ul-Haq will make his debut for Peshawar Zalmi. Andre Fletcher, Kieron Pollard have joined the squad in Dubai. Quetta Gladiators: Sarfraz Ahmed, Shane Watson, Rilee Rossouw, Umar Akmal, Ahmed Shehzad, Dwayne Smith, Mohammad Nawaz, Sohail Tanvir, Fawad Ahmed, Anwar Ali, Mohammad Irfan Jr.